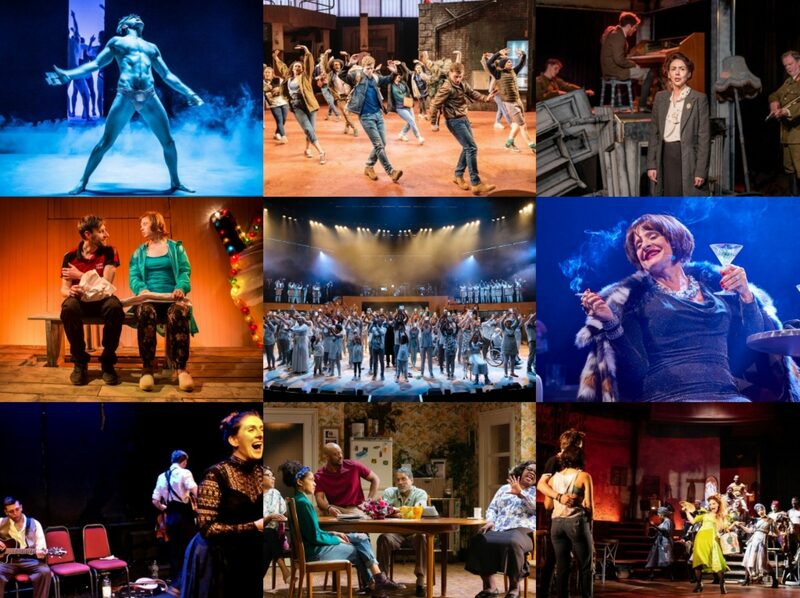 Sondheim once posed the question “Don’t you love farce?” which given the name of this blog is rather apt for me, and I can safely say that it is not a genre of which I have proven fond. I’ve given it several tries but I really wasn’t a fan at all of A Flea In Her Ear, Once Bitten or One Man Two Guvnors, though the Orange Tree’s Three Farces did hint at the possibilities within the form that I did actually find funny. Billington reckoned in his last review of One Man Two Guvnors that one “would had to have had a humour by-pass not to enjoy it” which seems a bit harsh – I’m not against people finding farce funny but senses of humour are individual and so different things make different people laugh. 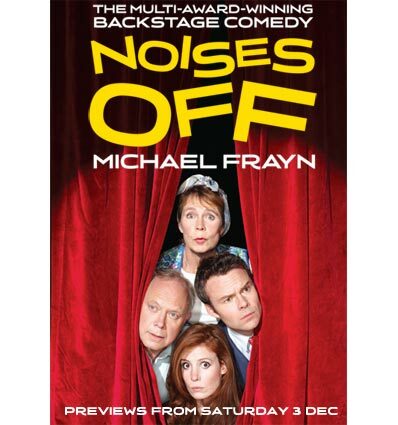 So you’d be quite right to think there was little chance of me going to see Michael Frayn’s Noises Off, the Old Vic having apparently decided that farce is their Christmas go-to. But I’m a theatre addict, and I love Celia Imrie, so I plonked down £20 for a restricted view seat (which happened to have several empty seats next to it, which I would never recommend that you could sneakily upgrade yourself to…) and gritted my teeth in readiness. Frayn’s play, directed here by Lindsay Posner, follows the experience of a touring theatre company who are taking on a play, a farce called Nothing On, and we visit them three times: firstly at their final dress rehearsal, secondly at a matinée performance somewhere in the run and then lastly at one of the final performances. Each act contains a run-through of the first act of the play within the play and through this, we see the subtle (and not so subtle) variations in the versions as the personal relationships amongst the cast deteriorate spectacularly, leading to increasing chaos both offstage and on. Dear reader, something happened to me. I did find the first half a little slow-going; it doesn’t help that my default position is to detest all those around me who start braying with laughter from the first word and it is often hard to recover from that sense of alienation. So the first act raised some chuckles, especially with Robert Glenister’s frustrated director yelling his cues and notes from the stalls and the frequent breaks from character that the actors made as the rehearsal grinds slowly to a halt. And as the first time we see the ‘farce’, my heart sank a little as it checked all the boxes of farcical comedy, the things that I’m not a fan of as doors are slammed, trousers fall down and plates of sardines are whooshed around. But then the second act started and it is an absolute masterstroke. We rejoin the tour (the blurb says on the first night, Wikipedia says a month later, Frayn says he’s rewritten it several times, so who knows – maybe I should have bought a programme!) but this time we see the play from backstage and it is hilarious. Just seeing the mechanics of how a play like this would work backstage is clever enough, but overlaid on top of that is the increasingly strained atmosphere as lovers fall out, love triangles are exposed and petty squabbles erupt at the simplest of things. This is all done in near-silence as the play is going on at the same time and it is a work of genius. Jamie Glover comes into his own here with a brilliant physical performance as the increasingly angry Garry who finds himself tied in knots. The final act then plays out back the normal way round, but the company are so tired, both physically and of the play itself, that the shenanigans have gotten even worse and the play literally falls apart onstage to uproarious effect as some actors carry blindly on, others try to improvise their way out of it and some just don’t give a damn any more. Janie Dee’s ever-resourceful Belinda, excellent throughout, particularly shines here as the one determined to make the show carry on and Amy Nuttall is also good as the dippy Brooke, unable to deal with any change and sticking blindly to the script even as the play falls apart around her. Posner has drilled his cast extremely well and in this last preview, I’d wager most if not all of multitude of comic hits were delivered perfectly. Celia Imrie is fantastic as the slightly up-herself actress playing the dim housekeeper (the inspiration for Acorn Antique’s Mrs Overall perhaps…? ), Jonathan Coy and Karl Johnson also do well as a wet blanket and a drunk respectively and Paul Ready makes the most of a small part as the stage manager (though for some reason, this feels like an odd choice for him). As in often the case, if one goes into a play with low expectations, it is easier to end up having a good time. But Noises Off is more than that I think, this is an intelligent comedy that does more than just repeat the same joke ad nauseam to get the laughs, and so becomes genuinely funny – especially when delivered by such a quality cast and creative team as it is here. In the end though, we all have different senses of humour and so everything I say is in relation to what makes me laugh, but I’d say this is destined to be one of the funniest things in London this winter. It's a cracking script, isn't it? I'm impressed that you remained impassive when presented with One Man, Two Guvnors – but succumbed to this. My preference was t'other way around! Hehe it was most unexpected;y good. I think I enjoyed this more because I felt it was more complex that a straight farce (a la 1M2G) and so Frayn was working hard to find genuine comedy rather than easy laughs in repeated pratfalls… Who knows, maybe if I revisited 1M2G I might enjoy it this time round, but I sure as hell ain't going to be the one buying the ticket!